Con el advenimiento de los materiales Bioactivos hoy hay un cambio de paradigma en el tratamiento de la protección pulpar directa. Está ampliamente demostrado en la literatura tanto en los estudios in vitro como in vivo, que estos materiales son más efectivos que el hidróxido de calcio para lograr cambios biológicos y microestructurales en el tejido pulpar y dentinario. Es así que surgen los materiales bioactivos, los cuales son sustancias que al ponerse en contacto con los tejidos vivos, provocan un efecto positivo sobre los mismos formando tejidos calcificados. Inducen una respuesta biológica específica en la interfase material-tejido. Actualmente los que cuentan con mayor aval científico son: MTA, Biodentine y Theracal LC. Docente de Alta Dedicación (PAD) en la Facultad de Odontología de la Universidad Católica UCU. Docente de la Clínica Integrada de 5to grado de la UCU. Colaborador Académico en la Especialización de Odontología Restauradora y Prostodoncia Fija. Docente colaboradora en la carrera de Especialidad de Prótesis fija y Odontología restauradora – Facultad de Odontología – U.C.U. Accorinte Mde L, Loguercio AD, Reis A, Muench A, de Araújo VC. (2005) Adverse effects of human pulps after direct pulp capping with the different components from a total etch, three-step adhesive system. Dent Mater; 21(7):599-607. Accorinte Mde L, Loguercio AD, Reis A, Muench A, de Araújo VC. (2005) Response of human pulp capped with a bonding agent after bleeding control with hemostatic agents. Oper Dent; 30(2):147-155. Besic FC (1943) The fate of bacteria sealed in dental cavities. J Dent Res; 22(5):349– 354. Bjørndal L, Reit C, Bruun G, Markvart M, Kjaeldgaard M, Näsman P, Thordrup M, Dige I, Nyvad B, Fransson H, Lager A, Ericson D, Petersson K, Olsson J, Santimano EM, Wennström A, Winkel P, Gluud C. (2010) )Treatment of deep caries lesions in adults: randomized clinical trials comparing stepwise vs. direct complete excavation, and direct pulp capping vs. partial pulpotomy. Eur J Oral Sci; 118(3):290-7. Camilleri J. (2014) Hydration characteristics of Biodentine and Theracal used as pulp capping materials. Dent Mater; 30(7):709-15. Cedrés C, Giani A, Laborde JC. (2014) Una nueva alternativa biocompatible: Biodentine. Actas Odontol; 10(1):11-16. Cohen BD, Combe EC. (1994) Development of new adhesive pulp capping materials. Dent Update; 21(2):57-62. De Souza Costa CA, Lopes do Nascimento AB, Teixeira HM, Fontana UF. (2001) Response of human pulps capped with a self-etching adhesive system. Dent Mater; 17(3):230-240. Gandolfi MG, Siboni F, Botero T, Bossù M, Riccitiello F, Prati C.(2015) Calcium silicate and calcium hydroxide materials for pulp capping: biointeractivity, porosity, solubility and bioactivity of current formulations. J. Appl Biomater Funct Mater; 13(1):43-60. Gutmann JL; Dumsha TC, Lovdahl PE. (2007). Solución de problemas en endodoncia. Barcelona: Elsevier. Hafez AA, Cox CF, Tarim B, Otsuki M, Akimoto N. (2002) An in vivo evaluation of hemorrhage control using sodium hypochlorite and direct capping with a one- or two-component adhesive system in exposed non-human primate pulps. Quintessence Int. ; 33(4):261–272. Han L, Okiji T. (2011) Uptake of calcium and silicon released from calcium silicate- based endodontic materials into root canal dentine. Int Endod J; 44(12):1081-7. Hebling J, Giro EMA, de Souza Costa CA. (1999) Biocompatibility of an adhesive system applied to exposed human dental pulp. J Endod; 25(10):676–682. Hilton TJ. (2009) Keys to clinical success with pulp capping: a review of the literature. Oper Dent; 34(5):615-625. Koubi G, Colon P, Franquin JC, Hartmann A, Richard G, , Faure MO, Lambert G. (2013). Clinical evaluation of the performance and safety of a new dentin substitute, Biodentine, in the restoration of posterior teeth: a prospective study. Clin Oral Invest;17(1):243-9. Laurent P, Camps J, De Méo M, Déjou J, About I. (2008). Induction of specific cells responses to a Ca(3)SiO(5)-based posterior restorative material. Dent Mater; 24(11):1486-94. Leksell E, Ridell K, Cvek M, Mejare I. (1996) Pulp exposure after stepwise versus direct complete excavation of deep carious lesions in young posterior permanent teeth. Endod Dent Traumatol; 12(4):192–196. Main C, Mirzayan N, Shabahang S, Torabinejad M. (2004). Repair of root perforations using mineral trioxide aggregate: a long-term study. J Endod; 30(2):80-3. Mente J, Geletneky B, Ohle M, Koch MJ, Friedrich Ding PG, Wolff D, Dreyhaupt J, Martin N, Staehle HJ, Pfefferle T. (2010). Mineral trioxide aggregate or calcium hydroxide direct pulp capping: an analysis of the clinical treatment outcome. J Endod; 36(5):806-13. Pameijer CH, Stanley HR. (1998) The disastrous effects of the “total etch” technique in vial pulp capping in primates. Am J Dent; 11:S45–S54. Pérard M, Le Clerc J, Watrin T, Meary F, Pérez F, Tricot-Doleux S, Pellen-Mussi P. (2013). Spheroid model study comparing the biocompatibility of Biodentine and MTA. J Mater Sci Mater Med; 24(6):1527-34. Ford TR, Torabinejad M, Abedi HR, Bakland LK, Kariyawasam SP. (1996) Using mineral trioxide aggregate as a pulp capping material. J Am Dent Assoc; 127(10):1941-4. Prosser HJ, Groffman DM, Wilson AD. (1982) The effect of composition on the erosion properties of calcium hydroxide cements. J Dent Res;61(12):1431–1435. Qureshi A, Soujanya E, Nandakumar, Pratapkumar, Sambashivarao (2014) Recent advances in pulp capping materials: an overview. J Clin Diagn Res; -8(1):316-321. Saunders WP. (2008). A prospective clinical study of periradicular surgery using mineral trioxide aggregate as root-end filling. J Endod; 34(6):660-5. Schwartz RS, Mauger M, Clement DJ, Walker III WA. (1999) Mineral trioxide aggregate: a new material for endodontics. J Am Dent Assoc; 130(7):967-75. Thompson V, Craig RG, Curro FA, Green WS, Ship JA. (2008) Treatment of deep carious lesions by complete excavation or partial removal: a critical review. J Am Dent Assoc; 139(6):705–712. Torabinejad M, Parirokh M. (2010). Mineral trioxide aggregate: a comprehensive literature review—part II, leakage and biocompatibility investigations. J Endod; 36(2):190-202. Torabinejad M, Chivian N. (1999) Clinical applications of mineral trioxide aggregate. J Endod; 25(3):197-206. Zanini M, Sautier JM, Berdal A, Simon S. (2012). Biodentine induces immortalized murine pulp cell differentiation into odontoblast-like cells and stimulates biomineralization. J Endod; 38(9):1220-6. Zhou HM, Shen Y, Wang ZJ, Li L, Zheng YF, Hakkinen L, Haapasalo M. (2013). In vitro citotoxicity evaluation of a novel root repair material. J Endod; 39(4):478-83. GIANI, Andrea; CEDRÉS, Cecilia. Avances en protección pulpar directa con materiales bioactivos. 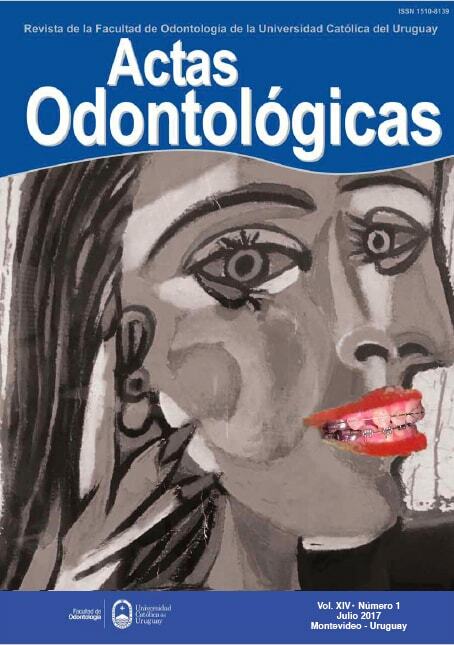 Actas Odontológicas (Publicación discontinuada), [S.l. ], v. 14, n. 1, p. 4-13, july 2017. ISSN 2393-6304. Disponible en: <https://revistas.ucu.edu.uy/index.php/actasodontologicas/article/view/1397>. Fecha de acceso: 23 apr. 2019 doi: https://doi.org/10.22235/ao.v14i1.1397.